This talk will explore the unfamiliar history of Albanian filmmaking as a window into Cold War-era collaboration and confrontation across the 1960’s Sino-Soviet split. The first films made in Albania were Soviet-directed films. 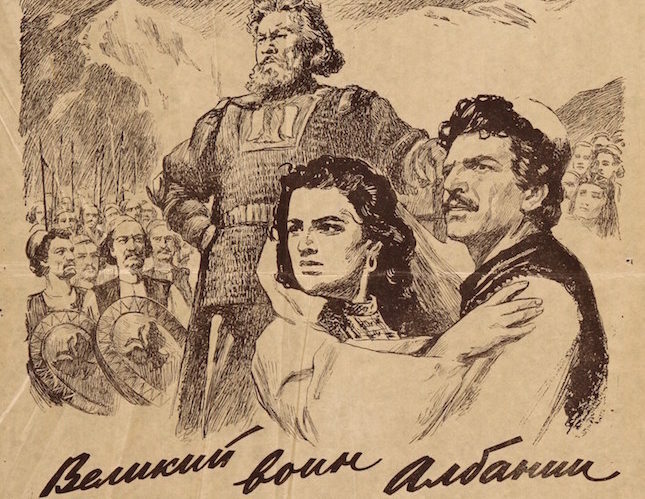 A high point of these heady years of friendship was Sergei Yutkevich’s Velikii voin Albanii Skanderbeg (1953), an epic dramatization of Albania’s 15th century national hero, Gjergj Kastrioti, and his crusade against Ottoman armies. The negotiations over Skanderbeg—about money, actors, the plot, distribution, and, eventually about meaning—reveal how the Soviet civilizational project could be used to tell a local story of heroic resistance, Ottoman backwardness, and Western betrayal. The Soviets brought their reels and actors to Albania—and they also designed the country’s first film agency, “Shqipëria e re” (New Albania), in 1952. Ten years later, however, the Soviet-Albanian friendship was dead. From instruments of friendship, films now became weapons in a global battle over the soul of socialism. As Albania’s Communist regime turned to Beijing for help, films assumed unexpected meaning, especially during China’s self-inflicted isolation of the Great Proletarian Cultural Revolution from 1966 to 1976. By exploring the economics of filmmaking and the politics of plots, this talk shows how Soviet training, design, and cinematographic tricks enabled a small and insecure country to go to war in China. Elidor Mëhilli teaches in the Department of History at Hunter College, City University of New York. He received a doctorate from Princeton University, held a postdoctoral fellowship at Columbia University’s Harriman Institute, and a Mellon fellowship at the University of Pennsylvania’s Humanities Forum. He has been a visiting fellow at the Zentrum für Zeithistorische Forschung in Potsdam (Germany), and at Birkbeck College in London (United Kingdom). His research has been published in the Journal of Cold War Studies, Kritika: Explorations in Russian and Eurasian History, The International History Review, and a number of other volumes. His research interests include modern Europe, authoritarian regimes, globalization, and political and economic integration and disintegration in the twentieth century. His book on socialist globalization through the angle of Albania under Yugoslav, Soviet, Eastern bloc, and Chinese patronage, is forthcoming from Cornell University Press. To receive a copy of Mëhilli’s paper please contact jordan.russia.center@nyu.edu. Image: Poster for Velikii voin Albanii Skanderbeg, 1953.